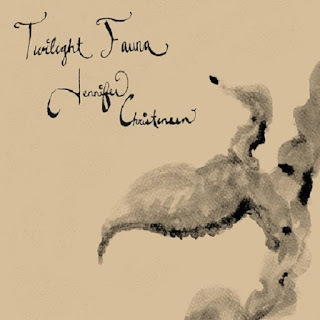 This is a review of a split ep between Oregon's Jennifer Christensen and Tennessee's Twilight Fauna which will be released in December by Red River Family Records and we will start off the review with Jennifer Christensen a solo artist best known for her work in the black metal band Mollehoj and goes for more of a neo-classical direction with her solo project. Her side of the split starts out with dark sounding cello's which also gives the song more of a haunting classical music feeling and the track also brings in other stringed instruments and the song is all instrumental and is 6 minutes in length along with the track staying away from any style of black metal sounds and the production sound s very dark. In my opinion this is a very great sounding track from Jennifer Christensen and if you are a fan of neo-classical, you should check out her side of the split. Next up is Twilight Fauna a solo project from Tennessee that has been featured plenty of times in this zine and plays an atmospheric form of black metal on other releases while he goes into more of an experimental direction with this song. His side of the split starts out with avant garde sounds and drones and a few seconds later black8 metal guitar riffs are added into the music and you can also hear some vocals in the background at times and after a few minutes clean playing in added into the song briefly which is also 7 minutes in length and when solos and leads are used they bring in more of a modern and atmospheric black metal style, the production sounds very dark and raw while the song themes cover darkness and nature. In my opinion this is another great sounding track and if you are a fan of experimental music and atmospheric black metal, you should check out his song. In conclusion I fell this is a very great sounding split and I would recommend it to all fans of experimental, neo-classical and atmospheric black metal. 8 out of 10.